Brian Capron, Vicky Entwistle (probably best known as Richard Hillman and Janice Bateersby from Corrie) Mollie Melia-Redgrave and Patrick Sullivan are confirmed to join Mark Williams, who plays the title role in the UK & Ireland Tour of Doctor Dolittle. Brian will play Albert Blossom/Straight Arrow, Vicky is Polynesia, Mollie is Emma Fairfax and Patrick is Matthew Mugg. Brian Capron and Mark Williams will appear from 9 November – 4 May at Bromley, Salford, Oxford, Wolverhampton, Newcastle, Hull, Aberdeen, Northampton, Nottingham and Sheffield only. Vicky Entwistle will play the full tour dates. 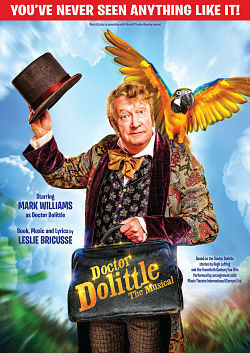 They will be joined by Harry Cross, Elliot Morris, Quillan O’Meara McDonald, Louis Parker, Thomas Ryan and Elliott Rose who alternate as Tommy Stubbins (the boy who takes an injured squirrel to Doctor Dolittle and becomes his friend) with ensemble members Femi Akinfolarin, Erica Jayne Alden, Lydia Bannister, Joel Bayliss, Evonnee Bentley-Holder, Jane Crawshaw, Emily Essery, Jacob Fisher, George Hankers, Catherine Hannay, Evan James, Leon Kay, Emma Lloyd, Ross Meagrow, Owen McHugh, Tom Norman, Emily Ann Potter, Ellie Seaton and Richard Vorster.